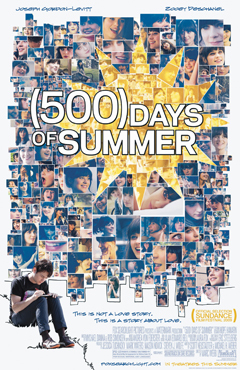 (500) DAYS OF SUMMER marked the feature directorial debut of Marc Webb and starred Joseph Gordon-Levitt and Zooey Deschanel. It was a hit at Sundance in 2009, receiving a standing ovation at its premiere screening, and it was lauded by many critics as one of the best films of the year. (500) DAYS received numerous awards and nominations, including the Independent Spirit Award for "Best Screenplay" for writers Scott Neustadter and Michael H. Weber and Golden Globe noms for "Best Picture (Musical or Comedy)," and "Best Actor (Musical or Comedy)" for Gordon-Levitt. The film first opened in theatres on July 17, 2009. This is a story of boy meets girl, begins the wry, probing narrator of (500) DAYS OF SUMMER, and with that the film takes off at breakneck speed into a funny, true-to-life and unique dissection of the unruly and unpredictable year-and-a-half of one young man's no-holds-barred love affair. (500) DAYS OF SUMMER inspired school film projects, marriage proposals and car commercials, not to mention inventive remixes of the trailer, as seen at the bottom of this post (recut to incorporate music from the upcoming INCEPTION). Zooey, Joseph and Marc made both a dance video and a reinterpretation of a SID AND NANCY; Webb and "the boys" shot flipcam video of a wild night on the town and Searchlight produced a huge array of behind-the-scenes videos - now featured on the film's official site and under the (500) DAYS OF SUMMER tag on FoxSearchlight.com. You can watch the trailer below. Excerpts from the overwhelmingly positive reviews are below and can be accessed in their entirety via Rotten Tomatoes. "A delightful comedy, alive with invention... In romance, we believe what we want to believe. 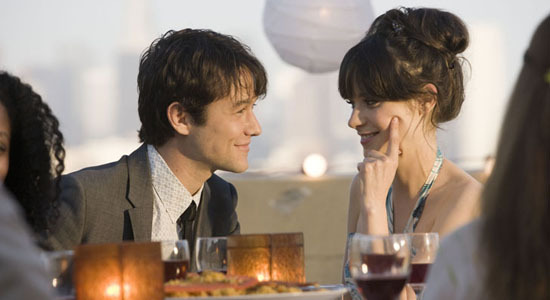 That's the reason (500) DAYS OF SUMMER is so appealing." "Finally, a romance that understands we mark our lives by our scrapes with love, and our defeats, rather than simply white-wedding-cake success." "Enchantingly original and romantic. Director Marc Webb, working from Scott Neustadter and Michael H. Weber's witty script, stages each scene as a vivid snapshot memory, and his sense of play is boundless. Grade A." "I loved this movie. One of my favorite movies of the year so far. It was so great." "Thanks to two wonderful, offbeat performances by Joseph Gordon-Levitt and Zooey Deschanel, this movie has charm to spare. It looks right in your eye and tells the truth." Photos From Zooey Deschanel's Key Ceremony Today! Deschanel On "Late Late Show with Craig Ferguson"